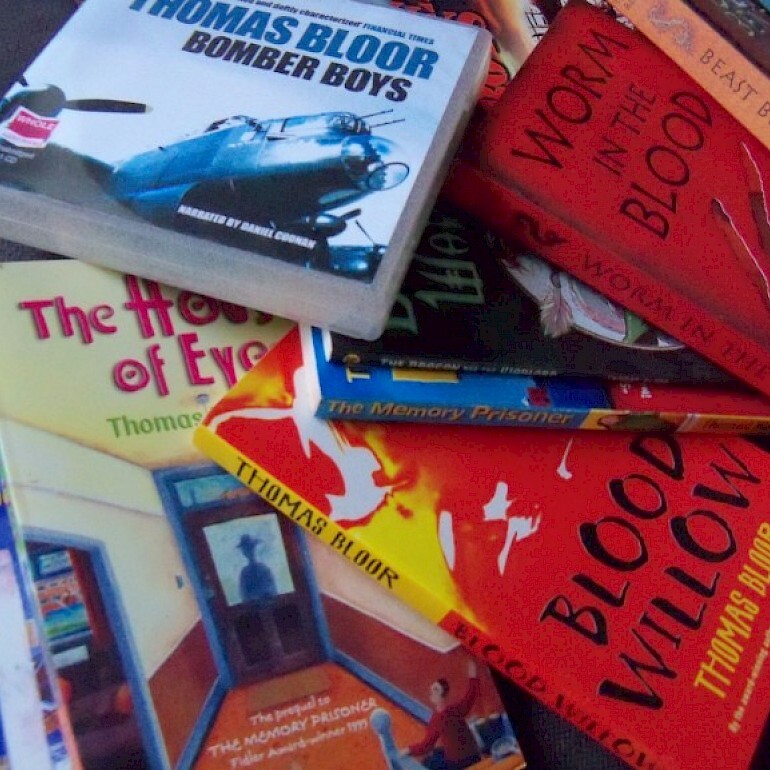 Thomas Bloor | Books, plays, films and other projects by author and playwright Thomas Bloor. Writer of Bomber Boys, The Dragon and the Warlord , The Memory Prisoner, Blood Willow, Factory of shadows and The House of Eyes. Thomas Bloor studied Fine Art at North East London Polytechnic in the 1980s. After graduating he helped set up The Changing Room Gallery in Walthamstow, showing work by local artists and communitiy groups. He became increasingly interested in the narrative content of his paintings and bas-reliefs and in the mid 1990s he began writing children's fiction. His first book, The Memory Prisoner, was published in 2000 and subsequent titles include The House of Eyes and Worm in the Blood. More recently he has written for theatre and performance. Plays include The Flower Maker's Tale first shown in London in 2018 and Night on the Field of Waterloo, which premiered in Manchester, 2013. He wrote and produced a multi-media project Jellicoe's Dispatch or Mermaids of Jutland in 2015/16. 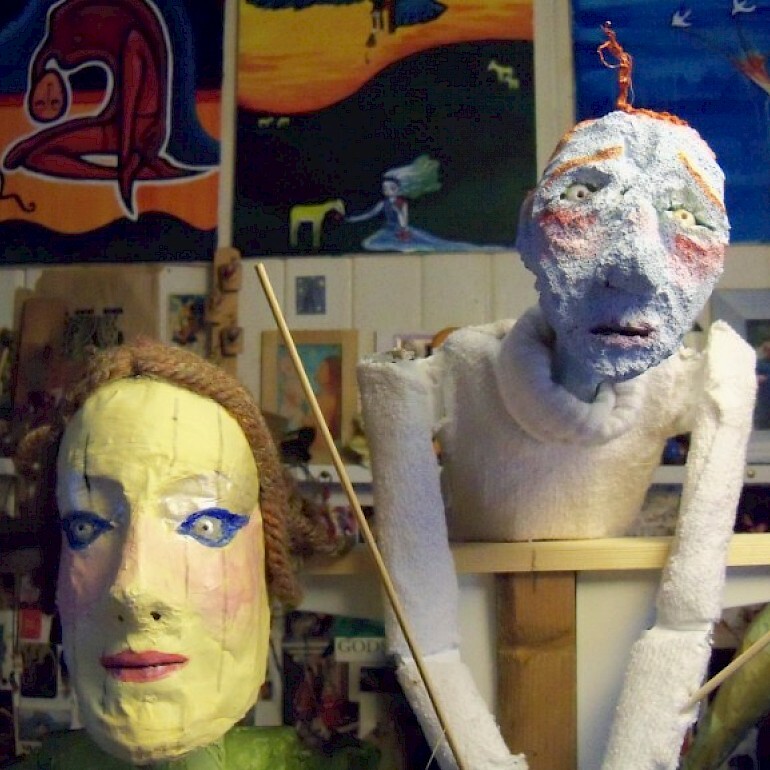 Thomas Bloor has built puppets and theatre props and he continues to write, and to draw and paint and make relief constructions. He also writes songs, makes audio recordings, and short films. A varied output then, but with a united interest in narrative and story-telling. This website is here to provide a platform for information on a range of these creative projects. Thomas Bloor's latest piece for theatre, The Flower Maker's Tale, was performed in London in 2018. Five years earlier, when his first play Night on the Field of Waterloo was accepted for performance at the 24/7 Theatre Festival in Manchester, 2013, he co-founded the informal production company Near Run Thing. Near Run Thing is a loosely organised, family-based group, set up to produce Night on the Field of Waterloo and any subsequent performance-based projects. Other Bloor family members involved in the group include visual artists Jo Bloor and Elaine Bloor, and actor and director Louise Bloor. Near Run Thing projects have also included other arts practioners, actors, technicions, puppeteers and theatre directors from all around the country. Near Run Thing went on to produce Thomas Bloor's Jellicoe's Dispatch or Mermaids of Jutland, a multi-media project that included a live puppet-based performance at the Little Angel Theatre, Islington, in 2015. The short play The Amazons at Troy by Thomas Bloor was performed in front of an audience as a rehearsed reading at the Sterts Arts Centre in Cornwall, in 2015. Further information on Thomas Bloor's writing for theatre and Near Run Thing productions can be found on our Facebook page and on Tumblr and you can also follow Near Run Thing on Twitter. A heap of books by Thomas Bloor. The following titles by Thomas Bloor were published between 2000 and 2009. Although these titles are all out of print they can still be found for sale via various online book sellers. More details on all these books can be found on my archived website. Thomas Bloor, seen here in pensive mood among the potted tomato plants. Thomas Bloor has enjoyed making short films since he was a boy, when he attempted to make and project his own movies using tracing paper, felt pens, a torch and a magnifying glass. He has since become a little less vigorously lo-fi in his approach. In a ten-minute video documentary made in 1997, Last of the Flower Makers, he set out to record his father's self-employed business making artificial flowers. In 2016 this film was shown at the Museum of London as part of a temporary display of flower making tools and equipment. 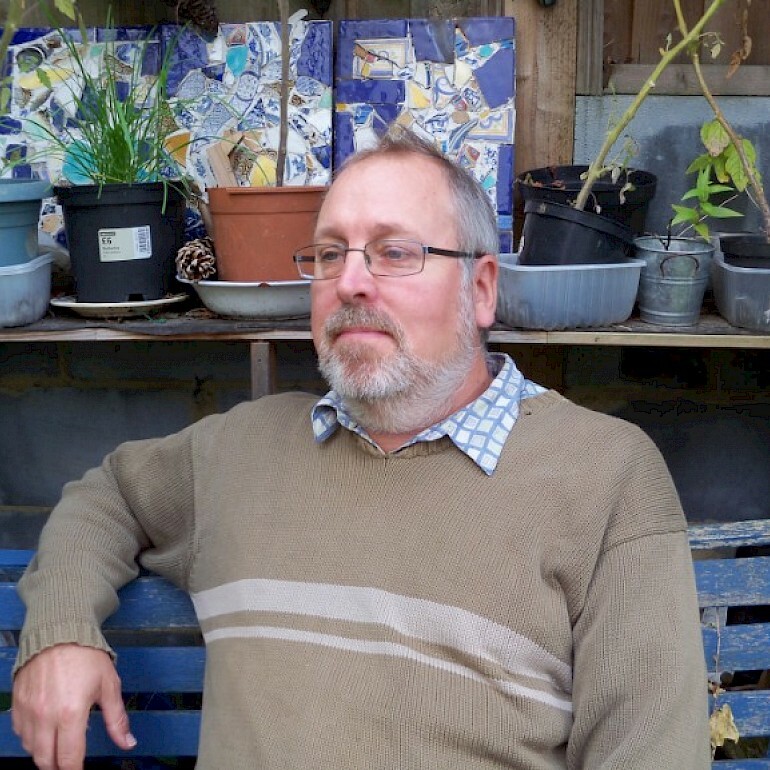 Thomas Bloor has shown films at various screenings in London, including at the ICA and the BFI, and has been a regular contributor to the Walthamstow International Film Festival. His three-minute tale of murder and enchantment, The Forest Bride, was short-listed for best animation at the Walthamstow International Film Festival in 2012. Based very loosely on the folk tale East of the Sun, West of the Moon, which can be found in the Virago Book of Fairy Tales, the look of this live-action shadow-puppet film was inspired in part by the work of Lotte Reineger. 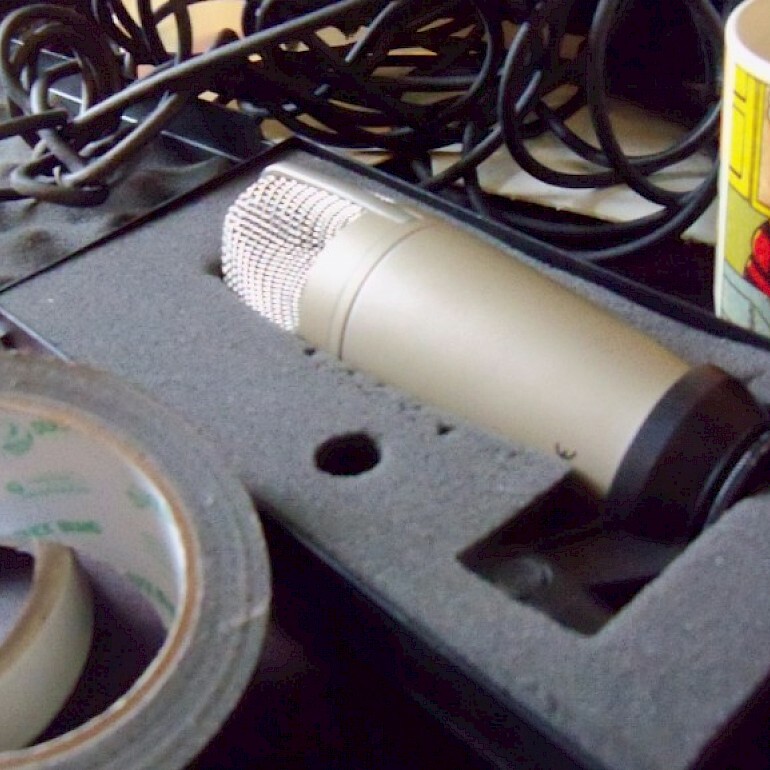 Gaffer tape, microphone and mug of tea. Thomas Bloor has been writing songs since he was a teenager. He formed several bands with friends, playing in and around the North East London area in the late 70s, early 80s, and again in the 1990s. In recent years he has been involved in a number of home-recorded music projects. His interest in both narrative song-writing and in sound recordings for his films and theatre pieces met with the creation of the Jutland Sound song collection, produced by Near Run Thing as part of the Jellicoe's Dispatch... project, (2015/16). Jutland Sound tells the story of the biggest sea battle of the First World War through a sequence of a dozen songs written and performed in a folk music style. For further enquiries, questions, etc. please feel free to get in touch using the email form. Privacy Statement. If you do send me an email I will reply where appropriate but I will not contact you again, nor will your email/email address be processed or sorted in any way. I don't send mail outs or keep contact lists. I will never share your email or email address with anyone and am happy to delete your email/email address from my inbox on request. And I will protect my email account with a strong password.